The Savannah Riverfront is excited to host the first annual Ultimate Tailgate during their Labor Day Celebration on River Street! Watch your favorite college football teams as they kick off the season! Come show your spirit and support while enjoying ice cold beverages, delicious food and your favorite tailgating games. Multiple games will be playing on three large inflatable screens to provide you with the best view outside of the stadium! The Arbor Stage will feature a 15 ft screen in addition to two 10 ft screens at each end of Rousakis Plaza. No need for lugging your tent, cooler or grill because the Savannah Riverfront has got you covered. 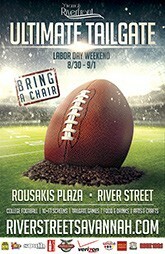 Just make sure to bring your favorite chair and come early to stake out your space near the big screens. Make sure to take a break during halftime to browse through over 30 local and regional artist booths. Arts & crafts will be on the second plaza featuring their unique paintings, woodworks, sculptures, jewelry, photography and more! Weekend festivities will take place August 30-September 1. Festival hours are noon-11pm on Friday, 10am-11pm on Saturday and 10am-5pm on Sunday. This year’s Festival Series is hosted by the Savannah Riverfront and proudly sponsored by Verizon Wireless, Southern Eagle Distributing, Savannah Coca-Cola, Wet Willie’s, and our friends at Adventure Radio. Enjoy the Savannah Riverfront: The Way to Experience Savannah.